Rethinking Faith and Church: Religion's Most Dangerous Job? but the simple go on and suffer for it"
I typically do not watch much TV, but I remember watching a couple programs a while back about some of the world's most dangerous jobs. It's amazing some of the things people do to make a living. When you look at some of those dangerous work conditions, it is equally amazing that anyone would even bother to work in that industry at all. I have worked in a dangerous job for a few years too. However, my job never got mentioned on that TV program amongst the other dangerous jobs. Still, mine was probably "Religion's Most Dangerous Job." What job was that? It was an institutional church pastor. Oh, I know there are those who would sneer at that. I also know that there are those who would say that being a pastor is not a job; it's a calling. While in some cases that may be true, I'm starting to question that more and more. At any rate, I am not going to belabour that point at this time. 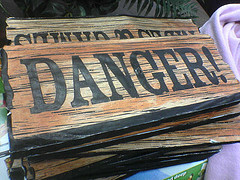 So what makes the pastoral office a dangerous job? Consider the following statistics from Frank Viola and George Barna's most excellent book, "Pagan Christianity." The authors further say that, "1600 ministers in all denominations across the U.S. are fired or forced to resign each month." That sounds almost unbelievable, doesn't it? Still, the Barna Research Group does seem to bear this out. At the very least it begs the question why anyone would go into the pastoral ministry as we've come to know it when it has such a high casualty rate. Yes, God gave some to be pastors, but I am convinced that what He had in mind was a "gift" of pastor (or pastoring) and not an "office" of pastor. Man has adulterated what God had in mind. It is no wonder we have statistics such as these. Could it be that we've turned the gift of God into something that He never had in mind in the first place? I believe that we have done exactly that. Yes, the pastoral "office" has evolved into a dangerous job, but perhaps it is made even more dangerous still by another fact. Perhaps it is even more dangerous in that those who persist in it as an "office" will one day have to give an account to God for profaning and merchandizing that which He intended to be a gift. God forgive us. Only in North America can the irrelevant Christian church write books, and articles about the "dangerous" job of being a Pastor. Wonder...how a Chinese pastor would see the "danger" of being...depressed? While he was being sentenced to life in prison for leading an unauthorized underground church? Or perhaps an Egyptian Pastor watching his church being burnt to the ground while his parishioners are beaten, and killed? Or a Somali Pastor as he witnesses a parishioner having his head chopped off for the "crime" of being a Christian? Books like these show us every day the emptiness, and irrelevance of the North American church with it's self-absorbed obsession of imaginary travails. Problem being the reformation wasn't a reformation at all...just the same old state churchism with a different frock for Sunday. ...Wait..is that a tear on my cheek? GRIN. First, in defense of Viola, the book I quoted was not a book about the “dangerous job of being a Pastor.” The “dangerous job” part was a spoof (by me) off the TV show with a similar sounding title. I would have thought that connection would have easily have been seen. In quoting the book where I did, and in context, the danger being referred to was simply a danger to the pastor’s mental health and that of his family. As for the persecution of pastors and their parishioners in the third world, the religious experience of the North American church discussed in Viola’s book in no way belittles the atrocities committed in some of the places you described. With this I am sure Viola would concur. However, as for the “every day the emptiness, and irrelevance of the North American church with it's self-absorbed obsession of imaginary travails” that you speak of, you have no disagreement from me. If you haven’t already done so, I would encourage you to consider reading “Pagan Christianity.” In doing so you would see that Viola doesn’t exactly paint a pretty picture of it either. But the story doesn’t end there, as more recent books by him show. Correction. I should have said, "you have no disagreement from me in principle." In other words, assuming that I'm reading you right. If I'm not, then I take that back. From Gerald on Facebook: "If you look at the statistics you posted in your blog, EVERY one of them is the result of people in the position of pastor trying to fulfil the work intended for the entire body. I wouldn't call it imaginary as much as self inflicted." Gerald makes a good observation in calling it "self inflicted." However, though it may be self inflicted, isn't it so precisely because that is what we have in error taught that a pastor does? This is the monster that we have created and boughten into; it is not what God has designed. Isn't the depression spoken of in those statistics the result of being out of the will of God? If the body were to start truly functioning as the body, with EVERY member doing his/her part as God intended, there would be no need for the current form of pastor. Then these statistics would be irrelevant and a non-issue. Until then, however, they'll continue. Leaders created the system, not the body. The institutional system is designed to keep people in need and coming back to it. There is no intention to equip and set the body free to minister to the world in a biblical way. Everything is designed around supporting and promoting the organization. The system has created masses that don't have any idea that they even have a kingdom calling, much less how to live it out. Modern day churches cater to those who basically want to be coddled and entertained. Then the pastors complain that people won't do anything. No kidding! Those are the people to whom they are marketing their churches! That is their targeted customer! Pastors don't want people who think outside the box of the system. I've had many of them get angry with me at the slightest suggestion of operating outside of the box. Their idea of outside the box is dressing the same, lame, old ideas in casual, hip clothes." 1) I believe it's our human nature to want someone to lead us and tell us what to do. It's just plain easier to have a person telling us what we need to do. The Israelites come to mind when they weren't satisfied with just following God but insisted they wanted a king. And God let them have a king with all the devastating results that followed for generations. 2) And I also believe it's in the nature of many to want to have high positions and set themselves up as leaders. The Judaizers that wrought such havoc in the church seemed to be made up of those who had been Pharisees and wanted believers to also follow the law. Of course, that meant they (the Pharisees) would be looked to to teach and lead the "ignorant" Gentile believers. So, I guess I don't think either the chicken or egg came first. :-) But it was starting to happen even in the early church, and Paul tried to warn the churches about it. The lesson is that our human nature will listen to others try to set things up according to the world, so we need to listen to the Holy Spirit and rely on His power and guidance to keep our focus on Christ Jesus. Perhaps the great irony is that, while an IC leader presumably teaches a follower how to think through matters of their faith, ultimately the follower thinks less and less for themselves because they're always told what and how to think. Hmm. Thanks for the comment, Catherine.